$650.00 includes the class fee, kit, pattern, and lunches. An additional supply list will be emailed closer to the event. The fee does not include lodging or travel. We have reserved a block of rooms in the new hotel where the event will be held. There will be a $200.00 non-refundable deposit to hold your spot. Balance due 60 days prior to the event. Your reservation confirms that you agree to the terms. 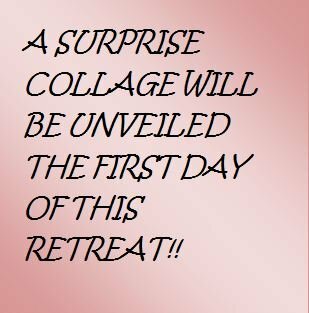 This retreat is specific for shop owners and people who what to teach my collage technique. We will discuss the kit cutting process to help your shops in cutting your collage kits with a focus on packaging, merchandising and pricing. You will spend Saturday making a new collage pattern that Laura designed specifically for this event. You and your shop will be the first to have this pattern, and you will have your sample ready to show! The additional supply list will be emailed closer to the event. You will want to bring things like scissors, Applique Pressing Sheets, and a few other notions. Your $200.00 deposit is non-refundable and acts as your registration. We will send a notice to the email address you have provided on your order form when the final payment is due (around 60 days prior to the event). If you need to cancel your registration and you notify us within 30 days of the date of the event then your final payment minus a 5% processing fee will be refunded. No refunds will be given for cancellations within the 30 days prior to the event, unless we are able to fill your spot, and only the final payment minus the processing fee will be refunded. You may have the option to move your deposit and final payment to another retreat. You may also transfer your registration to another person.